In this module you will consider the disadvantages of self-cherishing and the advantages of cherishing others more than ourselves. Learn how to employ the special techniques of mind training, or “lo-jong,” as a means to transform problems into happiness and learn to like problems, as Lama Zopa Rinpoche says, "as much as ice cream." 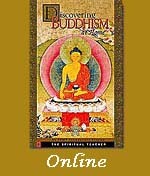 A 26-minute video for Module 11 from the Discovering Buddhism DVD. Four teaching sessions and three guided meditations taught by Ven. Tenzin Tsapel. A PDF transcript for all these teaching and meditation sessions is also provided.